Firefighters are crazy, but I've decided that we aren't crazy enough. On the one hand, we willingly respond day or night to infernos and mangled chaos and scenes of human desperation. The only constant is the variability of each scene. Only crazy people would choose that line of work. On the other hand, we are stuck in age-old traditions and mindsets, and can be resistant to change. I wonder if exposure to chaos drives this stubborn adherence to tradition. We have no control over an emergency scene until we arrive, so we rigorously control the way we respond, as well as every other aspect of our culture. This regimented approach to disaster enhances safety, and helps us restore order to scenes of destruction. When it spills over into our non emergent operations, however, it can have a negative impact on our ability to adapt and grow. Tradition is like the ballast in a ship. It lends stability, but it weighs down the organization. As long as we have smooth sailing, everything is hunky dory, but if we encounter stormy seas, we may have to pitch some stuff overboard if we want to stay afloat. The volunteer service in particular faces turbulent times. Only a crazy person would throw tried and true traditions overboard in the face of recruiting crises, budget cuts, and liability time bombs, but in reality that might be the safest thing to do. We might have to jettison the past to survive the future. We need a generation of crazy leaders. Chad presented on volunteer recruitment and retention today at the Ontario Association of Fire Chiefs Conference in Toronto. At the end, he briefly discussed the Fire Within, and the Heroes in the Sky event. I'm not sure if I read the crowd correctly, but I didn't sense a lot of enthusiasm about camping on roofs. I am certain that each firefighter in the room could tell stories of crazy innovations that saved the day on the fire ground, but that craziness appeared to be firmly stuffed down in the face of a unique and innovative idea . . . one that could potentially revolutionize an ailing volunteer service. We just aren't crazy enough sometimes. 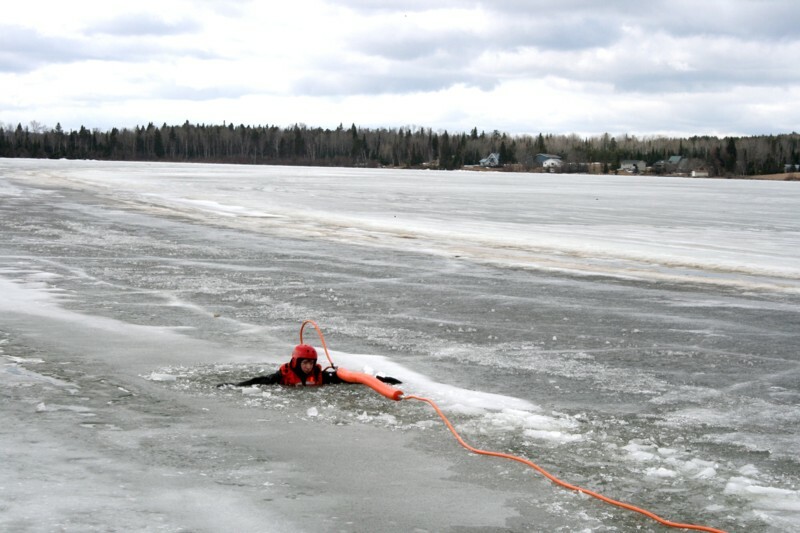 Speaking of crazy firefighters, I'm posting some of the ice rescue training pictures from Dryden that I promised earlier. Thanks very much to reporter and photographer Ally Dunham from the Dryden Observer for sharing the photos, and Reagan Breeze from Dryden Fire Service for making the arrangements. 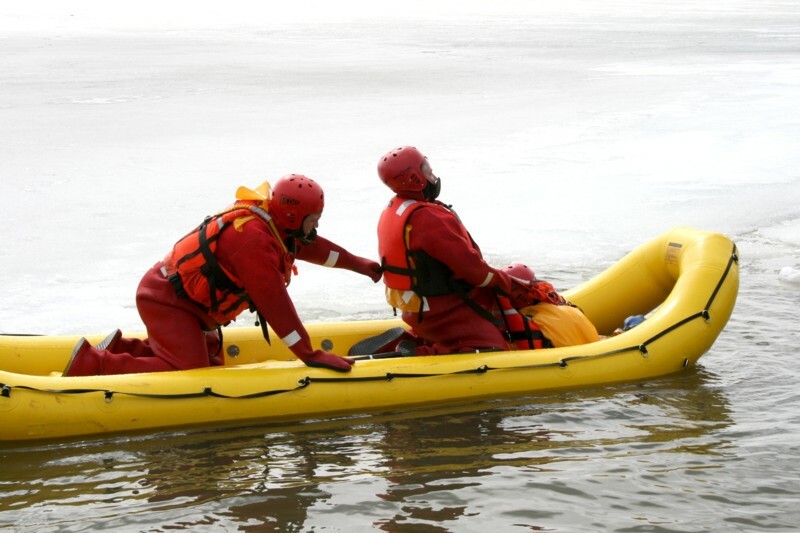 Here is a simulated rescue using a Kelhobby tool, a land based ice/water rescue device. A simulated rescue using the Fortuna. What you don't know is that some of the red entry suits are full of holes . . . but you can be sure that the firefighters knew. 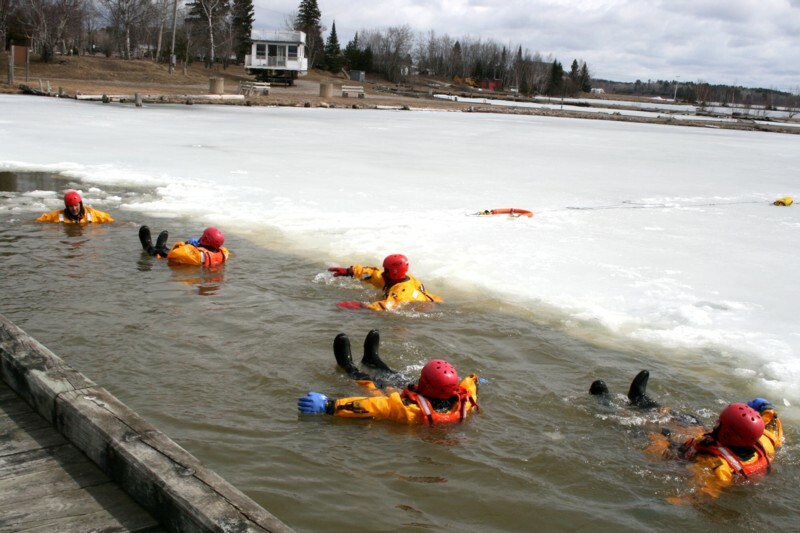 It may be just me, but it seems a little crazy that a small city surrounded by lakes and rivers is reluctant to buy new equipment for firefighters that are crazy enough to give up Easter weekend to train in ice water. But it might be just me. Maybe if the Dryden crew was crazy enough to try camping on the roof for one day . . . Speaking of crazy things, don't forget to vote for the fourth time in seven years. Or is it the seventh time in four years. Anyway, don't forget to vote on Monday.